So long, 2015, You Were Pretty Awesome! With the year drawing to a close and Thanksgiving later this week, I found myself reflecting on 2015. Since joining Scootadoot last November, I’ve gotten to do a lot of great things and meet some really wonderful people. I’d like to take a sec to just say I’ve had a great time being a Chick, and thought I’d share some of my favorite memories from my first year with Scoot. 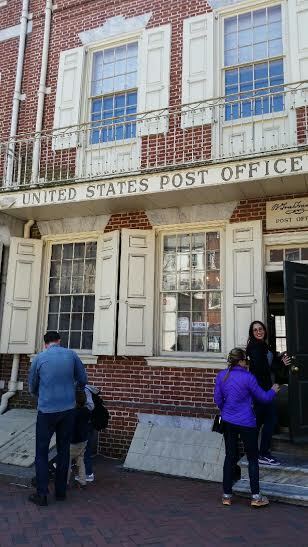 Philly Stray Boots Tour – This self-guided walking tour was the kick-off to a great first half marathon weekend! 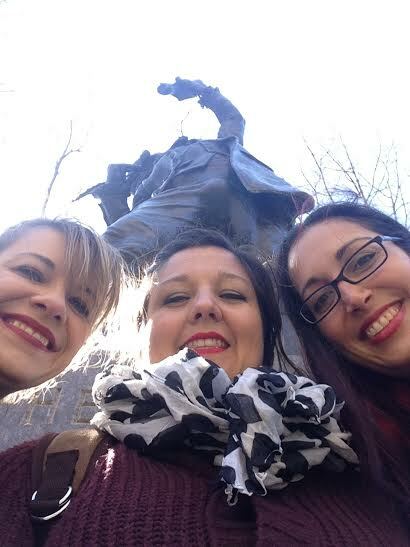 Meri, Cam, and I saw the sites of historical downtown Philadelphia while looking for clues scavenger hunt style. The fact that it was self-guided meant that we weren’t part of a group crowded around a guide in period costume tell us stuff we earned in elementary school. 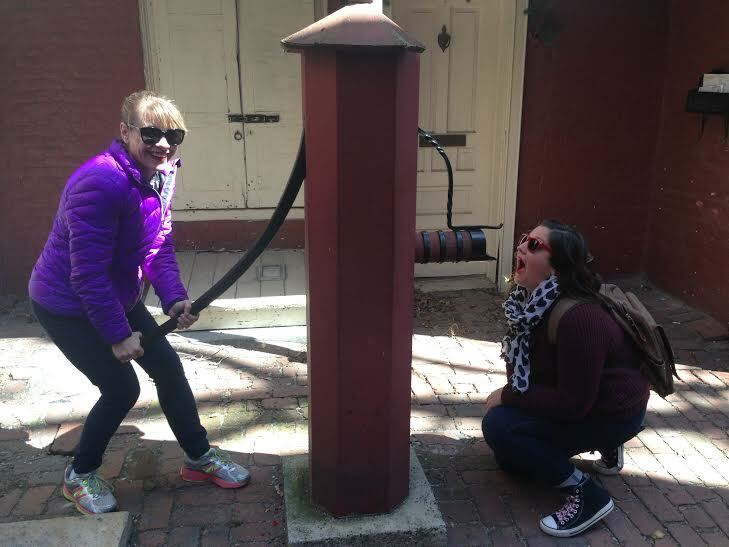 Plus, we’re occasionally inappropriate, which likely would not have been appreciated by fellow tour goers with small children. An up the nose (and crotch) shot with a statue on the tour. See, inappropriate. 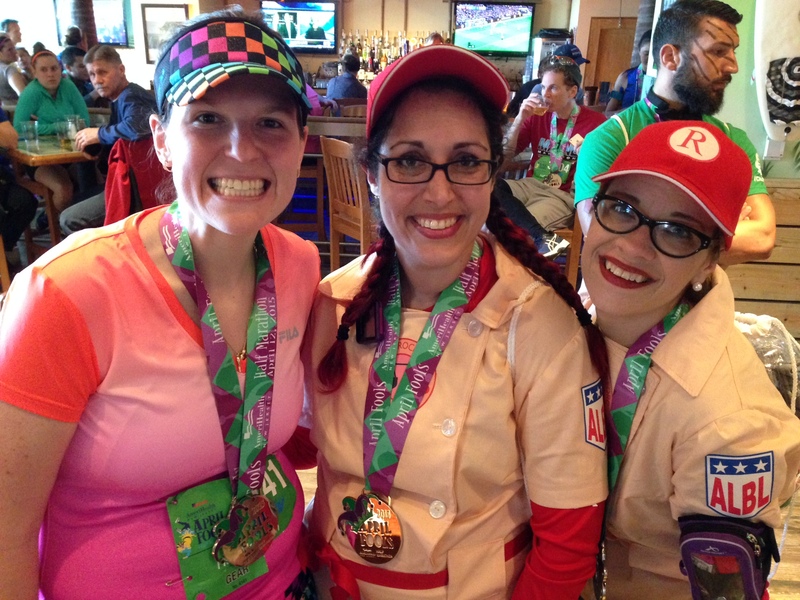 A few days later, I ran my first half with my fellow Chicks Mer, Cam, and Vic at the AC April Fool’s Half. There were so many things to love about this race! I hadn’t seen my girls for three years and a visit was long overdue! 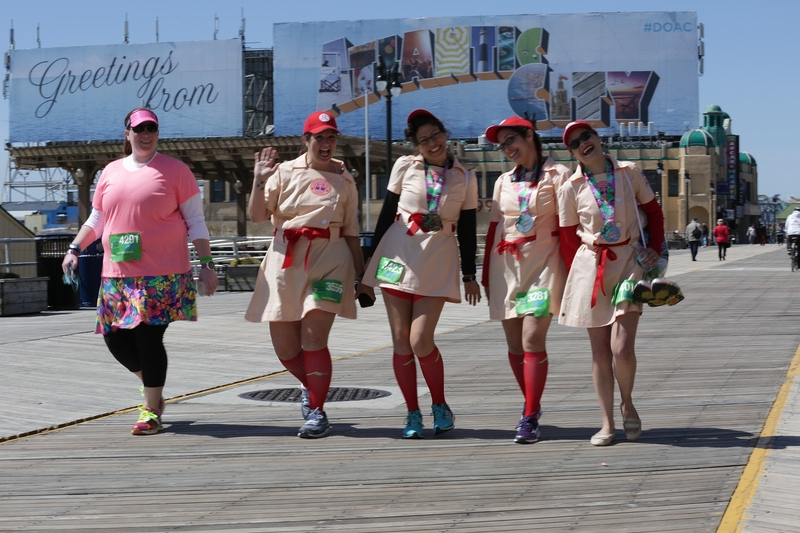 Plus, we had costumes, and they were cute, so there was that. I ran my half in 2:55 and was pretty darn pleased with myself! My first medal ever and it’s soooo purdy! I met some great folks, including Bonnie, a.k.a ‘Cuse Runner Girl! Bye, Bonnie! Until next time! Meri and I played cat and mouse with these lovely people the whole race, then shared a beer afterward. The best part was the end! Seriously, when I saw that finish line I was SO HAPPY. 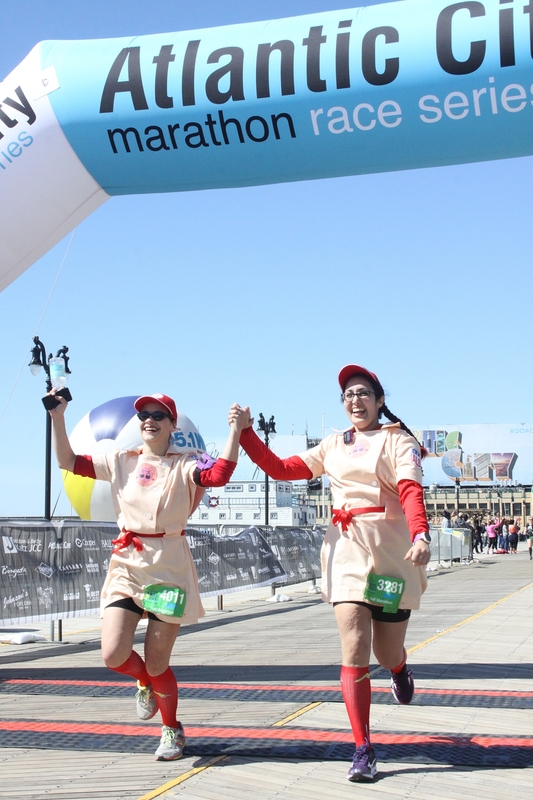 I grabbed Meri’s hand as we crossed because there wasn’t anyone else I would have rather finished my first half with. The other best part was the winning of the costume contest because we won stuff! After all the hard work Cam and I put into making our costumes and Vic and Meri put into looking cute in them, we celebrated with our favorite food group. 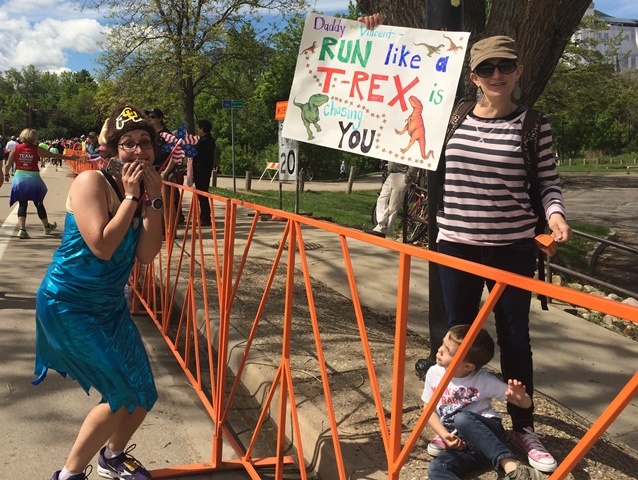 Then there was that time the Meridith came to visit me and we ran the BolderBOULDER! 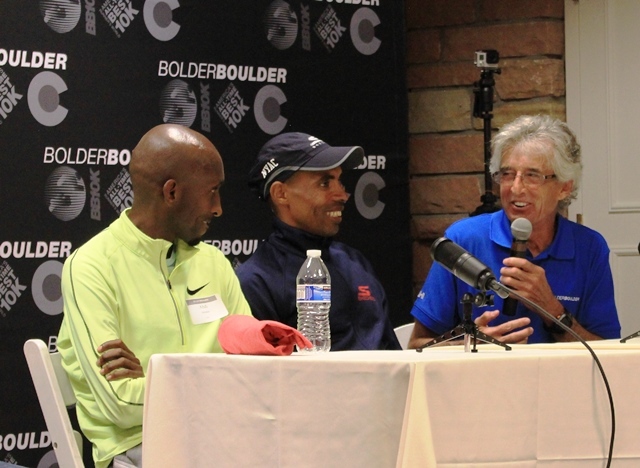 Before the race, we got to see Abdi and Meb and Pete at a press conference. It was certainly a highlight of the weekend. 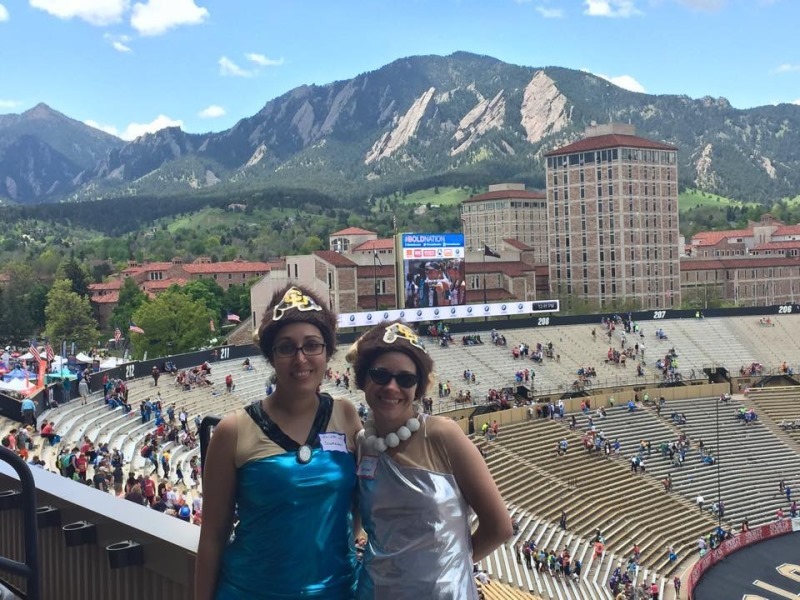 One of my favorite photos from this year, Meri and I at CU’s Folsom Field with the Flatirons behind us. Ready for a nap. And beer. Maybe beer, then nap. 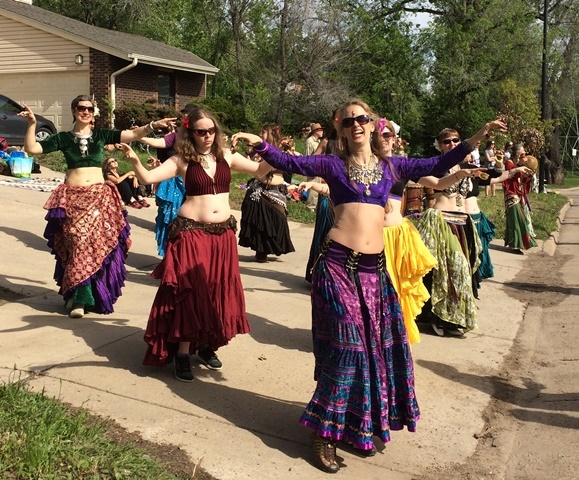 At what other race in this country do you see seriously talented belly dancers supporting and entertaining the runners? You will only see this in Boulder, folks. This might be my second favorite photo. Ever. 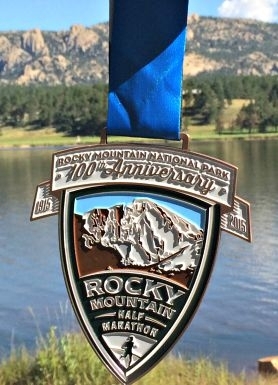 As the end of the summer came I focused on my second 1/2, the Rocky Mountain Half Marathon. 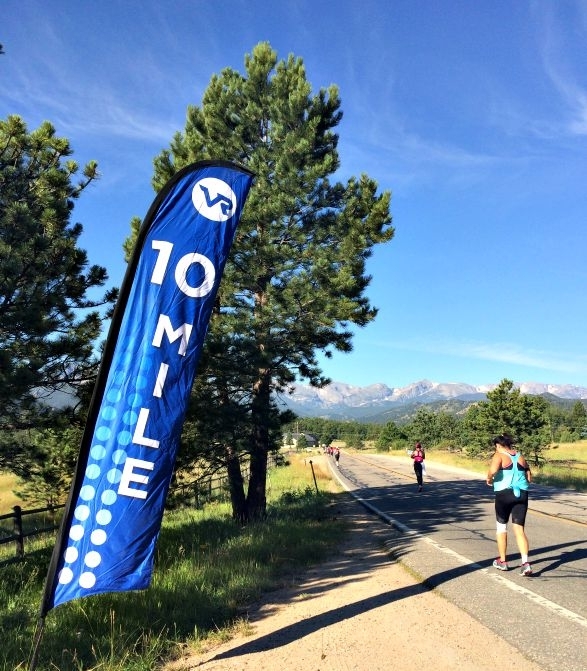 This was by far my biggest race of the year as far as fitness and athleticism were concerned. It was also the prettiest course I ran in 2015. I have nothing but positive things to say about this race, and it will probably be an annual entry for me from now on. The elite runners (and my husband) got to see some elk on the course! This was the hardest race I’ve run to date. 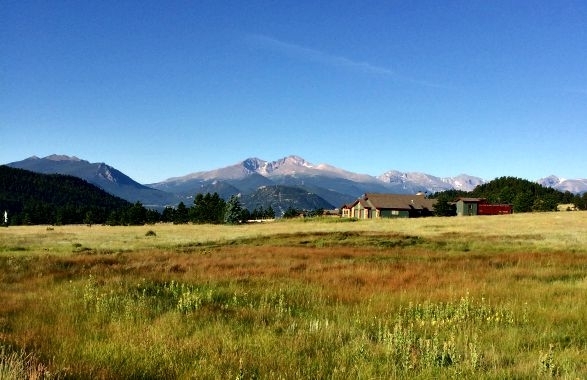 The elevation in Estes Park is 7,522 and the course gains just under 500 feet over its thirteen miles. That’s why I’m so proud of this gorgeous medal, it represents all the things I was told I couldn’t do as a person with asthma. Throughout the year, I pulled out my 2015 achievement board to check my progress. 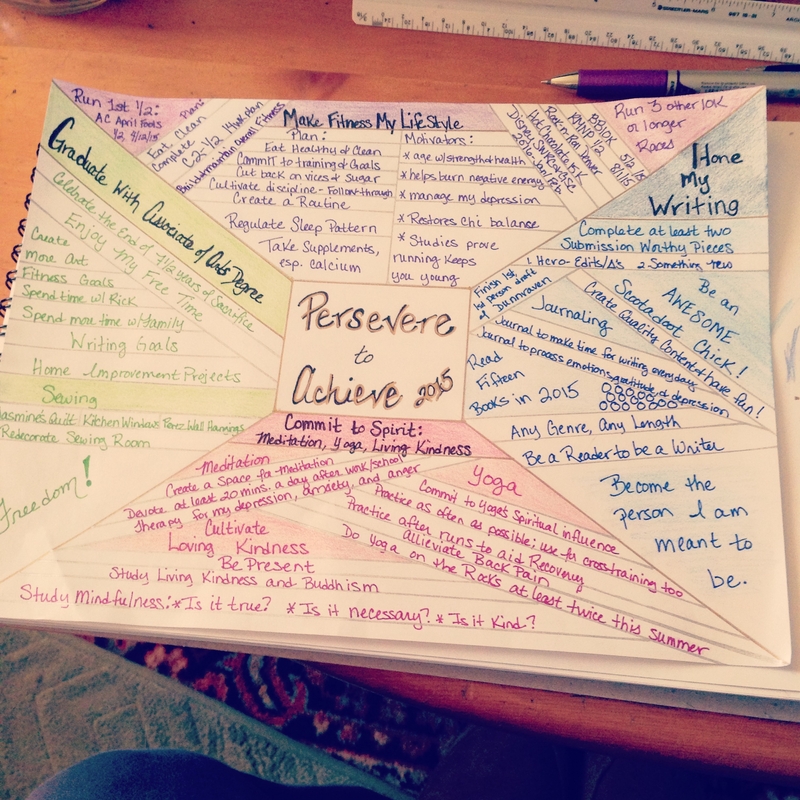 My goals were many and ambitious. Most of them did not happen. Some, however did, and the ones that I succeeded at were some of the most important I’ve ever set for myself. I can’t wait to make my achievement board for 2016. Most of all, I’m grateful to the other Chicks and all of you for welcoming me into your community. You all amaze me, and inspire me to keep setting the bar high. Thanks for a fantastic 2015, Scootadoot! What achievements are you most proud of this year? What are you setting your cap after in 2016? Tell me all about it in the comments! 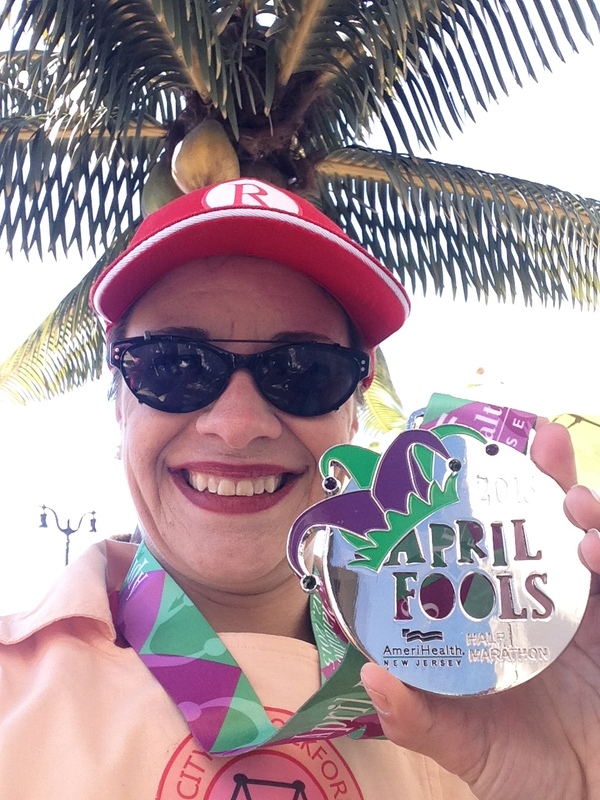 This entry was posted in Fun stuff and tagged 1/2 marathon, 10k, 5k, April Fool's half marathon, BolderBOULDER, fitness, half marathon, health, healthy living, Jenn, RMhalf, Rocky Mountain Half Marathon, run, runDisney, running, training, Vacation Races. Bookmark the permalink. It’s been a great year and I’m not just saying that because we got to hang out twice, although that definitely makes it even better! 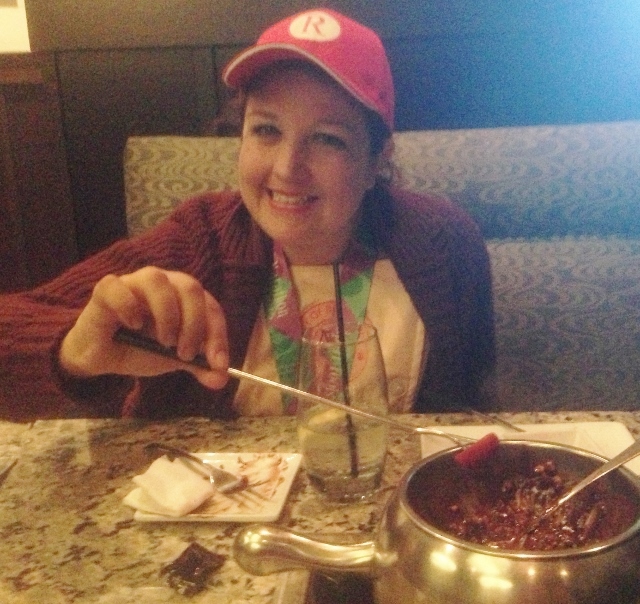 <3 Thanks for being an awesome friend, Chick, and Squish!